Before the electronic signatures were known by the public, all contracts, forms, payment authorizations had to be signed, shipped, faxed or scanned and the filed. This process takes up too much time out of a business owner's day not to mention time consuming, and costly. Enhanced Security: it's time to worry less about paper contracts and start managing your business the way you want to. dotFRONT SmartWebsites integrates this application as part of our platform. Increased Contract Speed: Electronic signing can prevent any unnecessary delays in finalizing contracts resulting in improved performance. 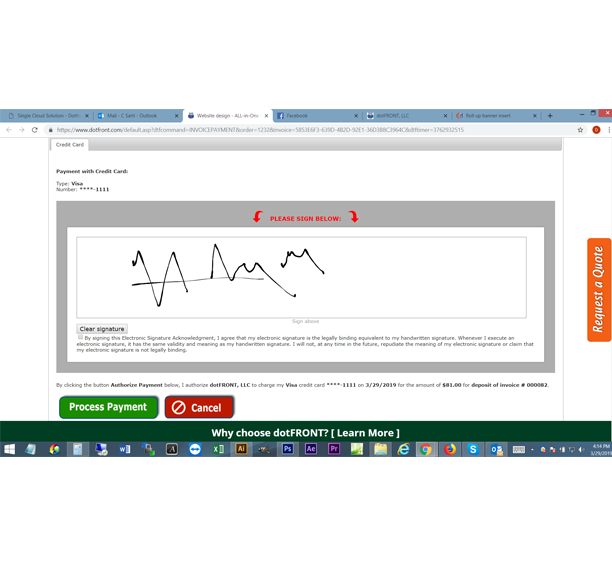 Lower Transaction Cost: the automated processes of electronic signing can reduce the financial impact of possible human error such as signing by mistake.